Our short film "The Rooster, the Crocodile and the Night Sky" will be screening at the Cork Puppetry Festival, which is taking place from 7-14th August. Congratulations to all the nominees and award winners at the recent event in Dingle. 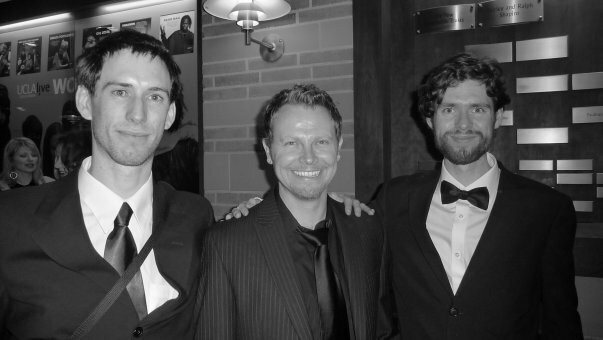 Three of the Little Caribou team won awards for their graduate films. Jessica Patterson (Best Design & Art Direction) for her film "Did you hear about her Dad? "; Simon Riley (Best VFX) for his film "Harvest" and Sean O'Reilly (Best Work in Progress) for his film "Silver's Millions". Well done to all. We're very lucky to have such creative talented folks on our latest project! We have now moved into our new studio space in the delightful village of Dingle on the west coast of Ireland where our crew are gearing up for pre-production on Little Caribou. A big thank you to the Galway Film Fleadh for awarding The Best First Short Animation to Tom Caulfield’s Unhinged at the Awards Ceremony last night. It is a wonderful start for the film.Thanks also to our funders on the project – the IFB, RTÉ and the Arts Council - as well as our crew. Tom Caulfield’s short animated film Unhinged will premiere at the Galway Film Fleadh on Saturday 11th July. The film was funded by The Irish Film Board, the Arts Council and RTÉ under the Frameworks short animation scheme. Thanks to Tom for the opportunity to work with him on the film and to our great crew – Travis Blaise, Darlie Brewster, Borja Chicharro Huertas, Avner Geller, Robin Hoshino, Sophia Kansanniva, Kim Kelly, Stevie Lewis, Mauro Maressa, Dee McDonnell, Ed Mitchell, Steve Morell, Mark Mullery, Mike Nguyen, Wendy Perdue, Rick Ruggieri and Sarah Walsh. Thanks also to Jill McGregor, Emma Scott, Pauline McNamara and Fionnuala Sweeney for their patience. Some more of our shorts are screening this week in Germany at the cellu l'art festival. "Agricultural Report" by Sydney Padua (who launched her new graphic novel The Thrilling Adventures of Lovelace and Babbage this week too). Also screenings is "The Rooster, the Crocodile and the Night Sky" by Padraig Fagan and Eimhin McNamara. Our 2009 short film Donkey directed by Louise Bagnall will be screening at the IFI in Dublin as part of an Irish animated shorts night on Tuesday April 28th at 18.30. Our short animated film "Pirogues" directed by Alice Bohl will be screening in Angouleme, France. Ireland is the guest country at the 3D Wire Market and Festival in Segovia, Spain this week. A collection of Irish shorts will be screening including “Donkey” by Louise Bagnall, “Mr Heaney - a Wee Portrait” by Dave Quin, “Cuilín Dualach” by Nora Twomey, “Fear of Flying” by Conor Finnegan, “The Crumblegiant” by John McCloskey and “No Strings Attached” by Dave Chapman. Our short animated film “Pirogues” directed by Alice Bohl has been selected to screen at the rural art festival called Les Arts Croisés which will take place from 11th September to 15th September 2013 in Normandy, France. Our short film “Pirogues” directed and animated by French artist Alice Bohl has been selected to screen at the Black & White Audiovisual Festival, 22-25 May, in Porto, Portugal. One of our short animated films “The Rooster, the Crocodile and the Night Sky” (directed by Padraig Fagan and animated by Eimhin McNamara) has been selected for screening at the 2013 Northwest Animation Festival. The festival runs May 17-.19 at the Hollywood Theatre in Portland, Oregon, USA. The entire three day festival will repeat May 31st to June 2nd at Bijou art Cinemas in Eugene, Oregon. Our animated shorts "The Rooster, the Crocodile and the Night Sky", “Agricultural Report” and “Donkey” will be screening this weekend at the Irish Film Institute as part of a celebration of 20 years of the Irish Film Board. Tickets are free. Our animated short film “Agricultural Report” directed by the multi-talented Sydney Padua www.2dgoggles.com will be screening in India as part of the 2nd IRISH FILM FESTIVAL OF INDIA. The festival will be launched by H. E. Feilim McLaughlin, Ambassador of Ireland to India in Delhi on April 1st at the India Habitat Centre and runs until April 4th before travelling for further screenings at the National Gallery for Modern Art, Bangalore (10-11) and The Metro Big Cinema in Mumbai (17-18). The Irish Film Festival of India’s “Drawing on our Experience” offers the Indian audience a first chance to see over 40 feature and short animated films from Ireland. “Agricultural Report” & “The Rooster, the Crocodile and the Night Sky” will be screening at the Alternative Arts Festival, Rua Red, South Dublin Arts Centre, Tallaght, Dublin, Ireland, 11-15 June 2012. Several Barley Films shorts will be screening at the Annecy Film Festival in France this year (4-9 June) as part of "Forty Frames of Green" - a focus on Irish animation. Included are "Donkey", "Charred & Feathered", "The Red Ball", "The Rooster, the Crocodile and the Night Sky" and "Agricultural Report". Headspace will screen in front of Pawel Pawlikowski’s feature film The Woman in the Fifth starring Kristin Scott Thomas and Ethan Hawke. Feb 17-29, 2012 at the IFI in Dublin. The film will screen as part of a ‘Shorts from Ireland’ selection at the Oporto International Film Festival Fantasporto. The festival takes place in Porto, Portugal from the 20th of February to the 4th of March. As part of First Fortnight, Ireland’s Mental Health Arts Festival, 2-14 January 2012, Headspace will screen at the Shortspace event in Filmbase on the 5th of January at 7pm. A selection of our animated shorts will be shown at the Temple Bar Tradfest in Dublin, 25-29 January 2012. The shorts to be screened will include 'Colour Contamination' and 'The Rooster, The Crocodile and The Night Sky'. Spotlight on Ireland: New Irish Animation - Screening: 6pm Friday Nov 18. “Donkey”, “Headspace” and “The Rooster, the Crocodile and the Night Sky” will be screening on the 2nd of September at the Wicked Filmschool Animation Showcase at the Courthouse Arts Centre, Tinahely, Co. Wicklow. Several Barley Films shorts will be screening at the Pop-Up cinema at Urban Junction in Blackrock, Dublin on Saturday 27th August. “Donkey” and “The Rooster the Crocodile and the Night Sky” will be screening in London at the Portobello Film Festival, 1-8 September 2011. “Headspace” directed by Patrick Semple and funded under the Irish Film Board Short Shorts scheme was nominated for the 2011 Irish Council for Civil Liberties Human Rights Film Awards which took place at the IFI on the 15th June. The winning film Listen to Me, directed by Mabel Lozano, highlights the plight of those exploited by human trafficking. “The Rooster, the Crocodile and the Night Sky” will be screening at a special focus session on the technique of cut-outs at the London International Animation Festival. The London International Animation Festival will be running from August 26th to September 4th at The Barbican along with other London venues and will be screening the best of the world’s most recent animation and some specialised programmes and retrospectives. “The Rooster, the Crocodile and the Night Sky” will be screening as part of an Irish Animation Selection at the Guth Gafa International Documentary Film Festival taking place in Gortahork, Co. Donegal from 10-16 June 2011. “The Rooster, the Crocodile and the Night Sky” will be screening at the Melbourne International Animation Festival in Australia, 19-26 June 2011, as part of a special technique focus on cut-outs. The selection includes films from Yuri Norstein and Norman McLaren. Screening time is 4pm, Sunday 26th June. The ZeBBie Awards are annual awards created by the Irish Playwrights & Screenwriters Guild — named in honour of O. Z. Whitehead — to acknowledge the best scripts written by Irish playwrights and screenwriters during the previous year. This year the short animation "Donkey" written and directed by Louise Bagnall was nominated in the Best Short Film Script category. The other nominees were Andrew Legge for "The Chronoscope" and Michael Creagh for "The Crush" (the winner). The delightfully relaxed event was held at the Sugar Club in Dublin on 12th May 2011. "Agricultural Report" and "Colour Contamination" will be screening as part of the animation selection on Tuesday 15th March at 7.30pm, Shebeen Chic, 4 Georges Street, Dublin 2. With the recent addition of “Donkey”, you can now find several of the studio’s shorts on the IFB short film channel website including, “The Rooster, the Crocodile and the Night Sky”, “Colour Contamination”, “The Red Ball”, “Agricultural Report” and “Charred and Feathered”. Donkey will be screening at the Worldwide Short Film Festival’s Monthly Screening Series A WORLD OF SHORTS, taking place on March 16th at the National Film Board of Canada in Toronto. Master Disney animator Eric Goldberg will be presenting a series of talks in Dublin commencing on Wednesday 16th February at the National Film School in Dun Laoghiare. Eric has animated for the Walt Disney Studios on Aladdin (The Genie), Hercules (Phil) and The Princess and the Frog (Lewis), directed the Carnival of the Animals and the Rhapsody in Blue sequences in Fantasia 2000, and co-directed Pocahontas. The event is supported by The Arts Council, The Irish Film Board, The National Film School (IADT) and Barley Films. The 13th edition of Madrid Short Film Week will be celebrated from the 8th to 13th of March. The Festival is organized by the Council of Sport and Culture of the Regional Governemment of Madrid for the purpose of developing, strengthening and spreading the genre of short films and providing an annual meeting place for professionals, creators and the public. Patrick Semple's short animation Head Space has been selected to screen at the Jameson Dublin International Film Festival running from 17-27 February 2011. The film will screen as part of the Irish Film Board Shorts Selection at 6.30pm on the 19th of February at the Irish Film Institute. As part of the Barley Films Animation Masterclass Series 2011 Mike Nguyen will be visiting Dublin to conduct a series of animation events. Mike primary interest is the hand-drawn animation film making medium. He received his Bachelor of Fine Art in Character Animation at the California Institute of the Arts in 1988. Since then, he has worked primarily in the feature animation industry as a Character Animator in various studios, including Walt Disney, DreamWorks Animation and Warner Bros. Feature Animation where he was a supervising animator on the critically acclaimed “The Iron Giant”. In 2000, he co-founded July Films, an independent theatrical animation production company. His directing debut is the theatrical animated feature entitled “My Little World”, currently in production. Mike has also been a Character Animation instructor at the California Institute of the Arts since 1994, and has also given animation workshops in Denmark, Canada, Ireland, Thailand, Korea and the USA. Mike will be giving a series of talks on animation at IADT and Barley Films. The event is open to industry members and students and is sponsored by The Arts Council, Barley Films, IADT and The Irish Film Board. Headspace, directed by Patrick Semple, has been nominated in the Best Animation Category for the upcoming Irish Film and Television Awards taking place in Dublin on 12th February 2011. The film was produced under the Short Shorts scheme with The Irish Film Board. Louise Baganll's short animation "Donkey" screens tonight on RTÉ 1 at 23.50. Louise Bagnall’s “Donkey” will be screening in competition while Sydney Padua’s ever popular “Agricultural Report” and Padraig Fagan’s “The Rooster, the Crocodile and the Night Sky” will be shown as part of an Irish retrospective at the 16th Encounters International Film Festival in Bristol, England, 16-21 November 2010. Joanna Rubin Dranger's "Miss Remarkable and Her Career" has won the Audience Award for Best International Short at the Corona Cork film Festival over the weekend. The Film was a co-production between Ireland, Sweden and Denamrk. 26 October 2010 - Finnish screening for "Pirogues"
'Pirogues' has been selected to screen at the Kino Union Film Festival in Kotka, Finland taking place on 12-13 November 2010. One of the themes at the festival is Paperless – films telling about illegal migrants to Europe, waiting for a permit of residence and sometimes working in uncertain work conditions. 22 October 2010 - Two French screenings for "Pirogues"
"Pirogues", a film that looks at the issue of illegal immigration, directed by Alice Bohl will be screening in France at two events celebrating animation. Both films directed by Louise Bagnall and produced by Niamh O’Donoghue will be screening at The Táin Festival in Dundalk as part of a month long celebration of local culture. The October issue of Print Magazine contains an article celebrating Irish animation and Irish animators. John Canemaker is a tenured professor and the director of the film animation program at New York University’s Tisch School of the Arts. In 2006 his film The Moon and the Son: An Imagined Conversation won the Academy Award for best animated short. He has also written numerous books on animation including The Art and Flair of Mary Blair; Paper Dreams: The Art and Artists of Disney Storyboards; Before the Animation Begins: The Art and Lives of Disney Inspirational Sketch Artists; and Walt Disney’s Nine Old Men and the Art of Animation. “Agricultural Report”, “Charred and Feathered”, “The Red Ball”, “Headspace” and “The Rooster, The Crocodile And The Night Sky” will all be screening at the Zaragoza Cinematheque in Zaragoza City in Spain, 6-9 October 2010. “Agricultural Report” will be screening at the Short Space event at Filmbase on 7th October at 7pm. Nordic Short Film Award at the Nordisk Panorama - 5 Cities Festival in Bergen, Norway. Louise Bagnall’s “Donkey” has been selected to screen as part of the Childrens Programme at the Cinanima Festival in Espinho Portugal , 1-8 November 2010. A selection of IFB-funded short films will be showcased at Culture Night (Friday 24th September) during a jam-packed evening of theatre, exhibitions, talks, music, readings, dance and literally events which will take place in 20 towns across the country on Friday 24th September. “Donkey” has been officially selected to screen in competition at Animated Encounters International Panorama program as part of Encounters International Film Festival in Bristol, UK, 16-21 November 2010. “Donkey” & “Head Space” are to be screened as part of the 20th Cinemagic International Film Festival for Young People taking place in Belfast, Northern Ireland from the 11th November - 26th November 2010. "Donkey" has been selected to screen in competition at ANIMADRID International Festival of the Animated Image of Pozuelo de Alarcón, Madrid, Spain, which runs from September 23rd to October 1st, 2010. Also screening as part of a retrospective at the festival will be "Agricultural Report", "The Rooster, the Crocodile and the Night Sky", "Charred and Feathered", "The Red Ball" and "Headspace". ANIMADRID (The International Festival of the Animated Image of Pozuelo de Alarcón-Community of Madrid) is organized by the Ministry of Culture and Tourism for the Community of Madrid and the City Board of Pozuelo de Alarcón, and its main aim is to promote and spread audiovisual animation, as well as to provide a meeting place for artists and the public. Patrick Semple's directorial debut short animated film "Headspace" will have its first international screening at ANIMADRID International Festival of the Animated Image of Pozuelo de Alarcón, Madrid, Spain, which runs from September 23rd to October 1st, 2010. Moving Images will be organising the 6th Singapore Short Film Festival this year (28 August to 5 September 2010). The objective of the festival is to champion the short film format, increase its profile and encourage Singapore filmmakers to develop their skills and art in short filmmaking via exposure to both local and international short films from fellow filmmakers. The film will screen as part of the "Taschenkino" event, a festival for families in a local park in Oberhausen on Sunday 25th of July. The free event is open air and takes place within the framework of RUHR 2010. Alice Bohl’s “Pirogues” and Louise Bagnall’s “Colour Contamination” have both been selected to screen at the 17th edition of the KROK International Animated Film Festival. KROK is an international showcase for animation films of the highest quality and diversity, organized as a river cruise along the Volga, enabling its attendants to visit many wonderful Russian cities between 18-27 September 2010. Several of our shorts are being screened this weekend as part of the free Summer Sensational event organised by the Temple Bar Cultural Trust from 8-11 July 2010. The selected films include “Agricultural Report” (1pm in Filmbase, Temple Bar, Sunday 11th July) and “Charred and Feathered” (5pm in Culture Box, Temple Bar, Saturday 10th July). “Head Space” a new short animated film directed by first time director Patrick Semple will be screening at the Galway Film Fleadh on Saturday July 10th at 3pm at the Town Hall Theatre (New Irish Shorts – Frameworks/Short Shorts). More details on the film and the crew can be found in our shorts section here. Louise Bagnall’s short animation “Donkey” has been selected to screen at the 9th Euganea Film Festival, together with a selection of short films and documentaries, which will take place in Este and Monselice (Padua, Italy) from the 9th to the 25th July 2010. To visit the "Donkey" webpage click here. After the recent win at the Festival Récréacourt in Paris “Pirogues”, directed by Alice Bohl, will be screening in the Shorts of Love Section at the 40th Giffoni Film Festival in Italy between 18-31 July 2010. More details on the film can be found here. The Frameworks animated short “Charred and Feathred” funded by The Irish Film Board, RTE and The Arts Council will be screening tonight on RTE 2 just after midnight. “Pirogues” will be screening on Monday 24th May at 8pm at the Mermaid Arts Centre prior to the feature film “Mugabe & The White African”. This year we will celebrate the 9th edition of the “Concorto Film Festival”: the short-film festival, which is held at the end of August every year in Pontenure (Piacenza), Northern Italy. 8 May 2010 – Polish Premiere for "Donkey"
“Donkey” has been invited to screen in the Children’s Programme at the 26th Warsaw Film Festival, 8-17 October 2010. “Donkey” will be screening at the Corona Fastnet Short Film Festival taking place at various venues around Schull from 27-30 May. “Donkey” will be screening at the Nova Cinema, Arenbergstraat 14, in Brussels this weekend as part of the children’s screenings organised by Filem'on. The youth film programme called SCHOOL OF LIFE-expanded offers three short film programmes for different age-groups and language skills and according workshops that will take place mainly in schools and colleges in Berlin, relying on the particular age-groups. The aim is to bring young people closer to the English language and British and Irish Culture through film. The non-profit project will start with a kick-off event at the Filmmuseum Potsdam from 03 – 07 May 2010 and will run for one year at Berlin schools, colleges and language camps until 03 May 2011. After the kick-off event the film will be shown within the short film programme approx. once in a week in closed screenings to a group of about 25 students. The workshops will be held by a lecturer selected for the programme. The film has been selected for the 3rd SEFF - Sisak Eco Film Festival in Sisak, Croatia. It will be screening in competition with ten films from Croatia, Bosnia and Herzegovina, USA, UK and France during April 2010. The festival promotes ideas concerning environmental protection and sustainable development. "Donkey" has been selected to screen in the Kids and Youth Competition at the 56th International Short Film Festival Oberhausen, running from the 29th of April to the 4th May 2010. “The Rooster, the Crocodile and the Night Sky" and "Agricultural Report" will screen at the Cine Gael Irish Film Society in Montreal, Canada on March 26th. 1 March 2010 - National TV Premiere for "The Rooster"
“The Rooster, the Crocodile and the Night Sky" will premiere on Irish TV tonight on RTÉ TWO at 11.25pm. "Pirogues" by Alice Bohl has been selected for the competition of Tricky Women Festival 2010 while “Donkey“ by Louise Bagnall was selected for the programme “Tierisches und Fabelhaftes“ (a special programme about “Animals and Tales”). The festival takes place in Vienna from 4-8 March 2010. "Donkey" and “The Rooster, the Crocodile and the Night Sky" have been selected to screen in competition at the 20th Cairo International Film Festival for Children taking place from 4-11 March 2010. “Pirogues” has been selected to screen at Le Festival Récréacourt taking place in the Paris region from the 15th to the 21st of March. “Pirogues” has been selected for the 40th Tampere Film Festival in Finland which takes place from 10-14 March 2010. Animation has been completed on our new short film “Head Space” directed by Patrick Semple and funded by Irish Film Board under their Short Shorts Scheme. The film will premiere at the Galway Film Fleadh in July 2010. The screenings run from the 19th of December to the 31st of January. The CERN film making club, Open Your Eyes Films, presents a festival of the best short films in three competitions: general fiction, science or scientific fiction, and science documentary. The festival will take place between February 16-20, 2010 in the Globe of Science and Innovation and other locations near Geneva, Switzerland. Barley Films has been nominated for an ASIFA-Hollywood Annie award for Best Short Animation by the International Animated Film Society for “The Rooster, the Crocodile and the Night Sky”. The film was made with the support of The Irish Film Board, The Arts Council and RTÉ under the Film Board’s FRAMEWORKS scheme for short animation. Directed by Pádraig Fagan, narrated by the legendary Frank Kelly and with animation by Eimhin McNamara and Orla McHardy the film is a tale of passion, loss, surreal comedy and explosive violence. It is animated in a cut-out style using cardboard, tinfoil, paint on glass animation and super-8 film footage to create a dreamy hand-made aesthetic. It was produced by Barry O’Donoghue. This is the third time the studio has been nominated in the Best Short Animation category at the Annies. Previous nominations include the multi-award winning Irish Film Board funded Short Short “Agricultural Report” in 2005 and “Boys Night Out” in 2004. The awards will take place in Los Angeles on February 6th 2010. “The Rooster, the Crocodile and the Night Sky' is the first professional short film I wrote and directed. It was a new experience to be paid money to make a short film, and as a result I became quite intoxicated by the extravagance and decadence of it all. Parts of it seemed very ridiculous. We discovered at one point that the cardboard from boxes of a particular brand of granola bar worked really well with watercolours. Of course we ended up buying boxes and boxes of them to make characters and backgrounds. The bars became a staple of our diet during the production. We mixed super-8 film footage, paint on glass animation, and cardboard cut out animation (scanning the cardboard cut outs into the computer for animation). It was exciting not knowing exactly how the film would look in the end. I think that visually the film fits together quite well despite the media being so mixed. “To create an organic atmosphere in the film, we utilised tinfoil, cotton wool, pressed flowers, corrugated cardboard and any other scraps we had lying around. The characters were created mostly using thin packaging cardboard, each part painted and individually cut out with a scalpel (for the Rooster alone there were over 980 separate parts). The animation was a mixture of cut-out on computer with hand drawn details, along with a painted-on-glass sea and sunrise. The character designs and styling of the animation was kept bold and dynamic. These elements were then digitally composited together, lighting and layering the scenes so they felt like a real set under an actual camera. The films have been selected for the International “Gold Panda” Awards for Animation of 2009 (10th) Sichuan TV Festival. The festival runs from 6-8 November. Pirogues will have its premiere screening in Africa at the Festival Les Toiles Animées, 3ème édition. The films are screening in competition at the 7th Mumia Underground World Animation Festival where 61 films from 27 countries will compete for the Best International Animation Award. 26th October to 1st November, Belo Horizonte, Brasil, Humberto Mauro Cinema, Art Palace and local schools. ICCL screening Sat. 7 Nov. at the Gate in Cork, as part of the Corona Cork Film Festival. It starts at 1pm and will be followed by a reception, where we’ll be launching the competition for 2010. 7 October 2009 - Another German screening for "The Rooster, the Crocodile and the Night Sky"
5 October 2009 - Second Irish outing for "Donkey"
Young Irish animator Patrick Semple has been selected by the Irish Film Board to write and direct the new animated short film “Headspace” under the Short Shorts scheme. Production on the project which explores the topic of abuse will commence in early October at the studio. The Rooster has been selected for the 10th Edition of britspotting - the British and Irish Film Festival in Berlin, 13-15 November 2009. The short animated film was produced under the Frameworks scheme with the support of The Irish Film Board, RTÉ and The Arts Council. The films will screen as part of the Samhlaíocht Kerry Film Festival, October 31st to November 7th 2009. The film will be screening at the Fantastic Film Festival in Lund in September and then at the Uppsala International Short Film Festival in October. 14th International Film Festival for Children and Young Audience "Schlingel"
Official selection “Monde comme il va”, 29th Amiens International Film Festival, November 13-22, Amiens, France. The films have been selected to screen at the Capital Irish Film Festival in Washington DC, USA, 10 - 20 December 2009. Alice Bohl's short animation about immigration was screened as part of the animation selection at the festival. Louise Bagnall's second short animation with Barley Films was presented as part of this years Frameworks programme at the Fleadh. The Frameworks Animation Scheme is funded by The Irish Film Board, The Arts Council and RTÉ. We are delighted that “Pirogues” was awarded second place in the film competition and are grateful to the selection committee, the jury and the staff of the ICCL for arranging this showcase of Irish films. The finalists: “My Identity” (Winner), “Pirogues” (2nd Place), “8 Things to Remember” (Third Place), “Children of Manila” (Audience Award), “Team Spirit”, “A Life Inside the Frame”. ”The ICCL Human Rights Film School competition is a project of the Irish Council for Civil Liberties (ICCL) in which the best of Irish filmmakers, directors, producers, scriptwriters (amateur and professional) have turned their hands to a making a short film on a human rights issue, helping us to raise awareness about human rights. Through the project and by looking at the inequalities which exist in Ireland - and around the world - we hope to inspire people to want to make a difference in the world around them.